Reading about "The Real State of America Atlas: Mapping the Myths and Truths of the United States" by Cynthia Enloe and Joni Seager (Penguin Books, 128 pages, $22.00) I had high hopes. After all, an attractive beyond belief graphic look at statistics that most readers find too dry to read about -- let alone contemplate -- cannot be anything but a good thing. I was disappointed when I quickly discovered that the authors, professors at two liberal universities in Massachusetts, all too often used the numbers to bash individual states -- all of them Red -- political parties -- invariably Republican -- and organizations like the National Rifle Association that they blame for mass shootings and what they consider excessive gun ownership. A state can have too many Walmarts, in their view. Virtually the only part of the book that was presented without bias was the one titled "State Profiles" beginning on page 104. The numbers on percentage of races per state, per capita income, population, land area, etc. are drawn from the 2010 Census. But even here, the authors include loaded categories like poverty level (always a difficult number to deal with, so they use the official ones provided by the state, commonwealth (Puerto Rico) or territory; the number of Walmart SuperCenters in a state (and they don't consider that a high number a good thing, you can take that to the bank); and the percentage of people living in households with guns. About that statistic, I was surprised to see my current state of Texas so low at 36 percent; Vermont, which all liberals and progressives profess to love, is much higher at 46 percent and West Virginia, which is generally deplored by liberals despite not having a death penalty, is even higher at 58 percent. Wisconsin, another favorite of "progressives," is higher than Texas at 44 percent. The percentage is a low 13 percent in Massachusetts, where the authors live. What the authors fail to point out is that states are much more complicated than the numbers would indicate; from my ten years reporting news in Wisconsin I quickly learned that the state is both Red and Blue, with most of the state Republican or conservative Democratic, both loving their guns, including hunting rifles, with only islands of liberals in Madison and parts of Milwaukee. After all, right-wing icon Sen. Joe McCarthy was a Wisconsin native. The same is true of, say, Texas, with liberals concentrated in Austin, and conservatives living with their beloved guns everywhere else. The authors use hog production and chicken slaughtering to bash the diet of Americans, showing a distinctly vegan bias. The statistics on obesity are generally based on Body Mass Index (BMI), which has been discredited by many researchers. Mississippi is the most obese part of the U.S., with 68% obese (U.S. 61%)., while they say the District of Columbia is the least obese area, with "only" half of the people, 50%, considered obese. I would dispute the latter, since I've seen plenty of fat people waddle about DC in my trips to "Taxation Without Representation" land (that's the slogan on the license plates, since racist Southern Democrats long ago declared the heavily black (58 percent according to this book) area to be forever without voting representation in Congress. Yes, you heard me correctly, Cynthia and Joni: Southern DEMOCRATS ruled that DC would be forever lacking in representation despite a 2010 population of 601,723, higher than sparsely populated Wyoming (563,626), and only slightly less populated than the biggest state in area, even more sparsely settled Alaska (with 710,231 people and "you betcha" lot more moose). 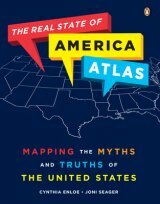 "Packed with fascinating facts and illustrated throughout with clear, easy-to-read, four-color graphics, "The Real State of America Atlas" draws back the curtain on our complex nation to reveal the myriad realities of the American experience-from our changing demographics to patterns of home ownership to the kinds of food we eat. Cowritten by two esteemed scholars, this comprehensive and enlightening work upends many long-held myths and shows us who we are today. It is the perfect read for anyone who wants to better understand our ever- changing nation." I have no qualms about the numbers, for the most part, that the two "esteemed scholars" present in lively graphic form; it's the conclusions that they draw from the numbers, including blaming the National Rifle Association (NRA) for murder rates, while neglecting to note the high murder rates of Chicago and New York and DC, where strict gun laws are in effect. Target shooting, my hobby, is a respected Olympic activity, represented in both the winter and summer games, so I don't have to apologize to anyone for my own NRA membership, let alone membership in a local gun club. As a libertarian who would like to see an end to our self-appointed "World Policeman" role, I'm appreciative of the statistics on military aid to countries, mostly in the Middle East (Israel, Jordan, Egypt, Saudi Arabia), but also to Pakistan and other countries that hate our guts. My solution: end the military aid to everybody. I would also like to see an end to military bases on which, like the old British Empire, "the sun never sets." Thanks, "esteemed" authors, for pointing out these numbers. Would I recommend this book? Yes, as long as you can separate the biases from the raw numbers. Any number of writers (my favorite being Darrell Huff's "How to Lie With Statistics" originally published in 1954 and republished thereafter; it's readily available on Amazon.com) have pointed out that numbers can be dangerous. "Lies, Damned Lies and Statistics" is a well-known saying attributed to Benjamin Disraeli. It was popularized in the U.S. by Samuel L. Clemens, much better known as Mark Twain: "There are three kinds of lies: lies, damned lies, and statistics." Either way, it's important to remember to approach statistics with care. Cynthia Enloe is research professor at Clark University in Worcester, Massachusetts, and has appeared on NPR and written numerous articles on feminism, militarization, and globalization. Joni Seager is professor and chair of global studies at Bentley University in Boston and recently served as a consultant to the United Nations on environmental and feminist policy issues.